Convene a coalition to address the issue of older adults and the misuse and abuse of prescription medication, over-the-counter medication and other supplements. Increase awareness about the dangers of poisoning in older adults from medication misuse and abuse. Educate about the safe disposal of all medications. Until the beginning of the BeMedSmart Program, prevention efforts in Pima county focused primarily on youth. In recent years, it has become evident that older adults’ medications have become a source of prescription medicine abuse for youth who live in or have access to the homes of older adults. Students transitioning into middle school and high school are at greater risk for substance abuse. In 2015, seven teenagers died from overdose and some of these were from sedatives (Pima County Medical Examiner, 2015.) 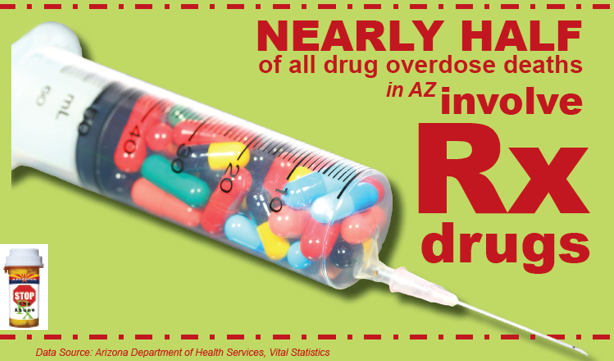 In 2015, seven teenagers died from overdose and some of these were from sedatives (Pima County Medical Examiner, 2015.) Pima County Youth Survey findings indicate that although prescription drugs have a lower rate of use, they have the highest negative outcomes. While supporting prevention activities surrounding medication poisoning in youth, BeMedSmart program has taken the lead in preventing medication misuse and abuse in older adults in Pima County by providing education to raise awareness of the risks of misusing and abusing prescription medications of all kinds. The main goal of the program is to promote safe use and safe disposal of all medications to prevent accidental poisoning in both youth and older adults. Improper disposal of medications contaminate our water system and we can inadvertently consume medication by drinking contaminated water. These may include pain killers, hormones, chemotherapy agents, even cocaine and amphetamines. It is not clear what levels of pharmaceuticals are safe for humans to consume, but the current levels have already caused irreparable damage to some wildlife and fish populations. They can harm our pets as well. PCOA offers educational presentations and materials for older adults and professionals serving older adults. Our working coalition meets monthly and is open to anyone interested in addressing this major national epidemic. For more information or to schedule a presentation, contact: Gertha Sicobo at 520-305-3425 or GSicobo(Replace this parenthesis with the @ sign)pcoa.org. This program is funded by Cenpatico Integrated Care. In addition to educating and increasing awareness, we have organized the BeMedSmart coalition to address prevention of medication misuse and abuse in older adults.